Anything Grows was established in 1995 in beautiful downtown Stratford Ontario Canada. For 18 years, we offered gardeners a unique selection of good quality, artistic and fun stuff for the garden. We introduced artists, products and made many friends. In the autumn of 2012 we closed our bricks-and-mortar store and in 2013 we launched Anything Grows SEED Company, our virtual and 'pop-up' store. We now also have a permanent location at The Western Fair Farmers Market in London, Ontario - open every Saturday. Anything Grows Seed Company's mission is to offer the gardener the best collection of vegetable and flower seed available. We want to be your go-to seed supplier. With over 500 varieties, we promote and offer fresh, quality seed in heirloom, organic, unusual and many popular categories. Working with 5 seed suppliers, including one organic local supplier, we have a custom program unique in the marketplace. With our convenient online catalogue, you have the option to shop at home. Or, if you choose, to research online, and visit us to shop in person at one of our many public appearances. We encourage and promote vegetable gardening for pure enjoyment, the cost savings of growing your own food, and the many health benefits of eating fresh and local. There are also so many creative ways to encorporate vegetables into you garden and lifestyle. With the variety and availability of heirloom seeds we now offer, the possibilities are endless--and really fun to explore and experiment. Whether you are a gardener or a cook, have a patio or a garden--dig in, and reap the rewards! Sprouting Seeds and the best Sprouter on the market are also part of what we support and sell. We sell only 100% organic sprouting seeds in a large variety of inidividual seed and delicious seed mixes. Sprouting is easy, nutritious and very rewarding. 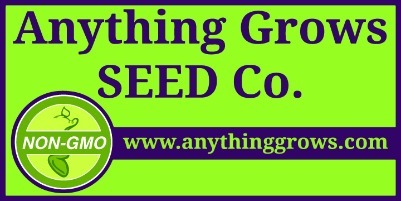 Anything Grows Seed Co. is owned and run by Allan Watts and Rick Weingarden. As gardeners, seeds have encouraged us and inspired us. Their variety and value is exciting as they offer an opportunity to 'play' with experimentation and design, in a way that purchasing plants won't allow. We are pleased to offer you the most exciting rare seed selection, and to share our experience and ideas.